I hear you all saying “you’ve been in Kennebunkport how long now and you just experienced the Marginal Way walk?” Yes, and let me tell you how that happened. We are in our fifth season of owning and running the 1802 House Bed and Breakfast in Kennebunkport. There’s a lot of great things to see and do in the Kennebunks and I think we’ve experienced (almost?) all there is to do in our immediate area. But sort of like living near the Grand Canyon and never seeing it, we live 30 minutes from Ogunquit and just never get down there. The Marginal Way cliff walk has been on our list of things to try since moving here. Our guests rave about it and we’ve heard about how beautiful it is….so we send all of our guests heading that way to walk it. This year we finally (!!) made it down there to see for ourselves and WOW. It really is something that you must do when visiting Maine’s southern coast area. 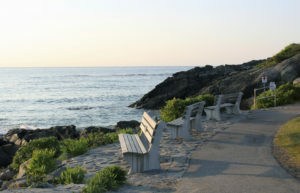 The Marginal Way is a paved walkway that runs just over a mile from Perkins Cove to the Ogunquit Beach. Most of the path meanders along the rocky coastline with little sandy pockets to explore. The only exception is a short section along Shore Road that takes you down to Wharf Road and the bridge. Shore Road is very busy with little shops and places to buy seafood and lobster rolls. Back on the path and heading towards Perkins Cove you’ll pass some beautiful scenery. There are 39 benches placed along the path so you’ve got plenty of opportunity to sit and enjoy the peace and serenity of the Atlantic Ocean, feel the salt air in your face and if you’re there the right time of year, enjoy the sea roses growing along the path. As you get closer to Oarwood Cove, you’ll pass a little lighthouse right on the path. It’s quite sweet, but not a working lighthouse. It does however house a webcam so if you need a little Maine and can’t get here to visit, you can check out what’s happening on the Marginal Way anytime of year, from anywhere in the world! Finally, whether you begin or end your Marginal Way walk in Perkins Cove, be sure to enjoy the lovely shops and restaurants in this bustling little seaside village. We loved the Sea Glass Jewelry Studio. This is the sister shop to the Sea Glass Jewelry here in Kennebunkport. Great shopping for friends and family back home. Another “must do” while there is to dine at MC Perkins Cove Restaurant. We were running out of time so that one is going to have to stay on our bucket list for a little while longer. We’ll blog all about it for you when we do get a chance to try it out! 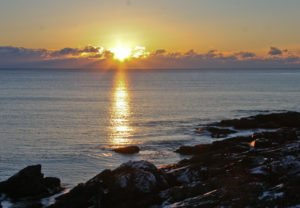 Have you walked the Marginal Way? What’s your favorite part?